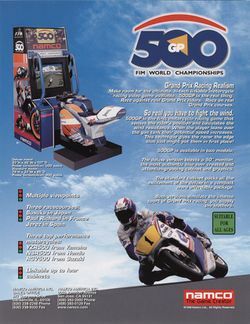 500 GP (full title: 500 GP: FIM World Championships) is a racing arcade game which was released by Namco in 1998; it runs upon the company's System 23 hardware, and allows up to four players to play it simultaneously when four one-player cabinets are linked together. The game features a trio of licensed circuits: the Suzuka Circuit in Japan which had previously appeared in Pole Position II, the first two Final Laps and both Suzuka 8 Hours titles, the Paul Ricard circuit in France, and the Jevez circuit in Spain - along with three licensed motorcycles (complete with likenesses of their riders): the Honda NSR500, the Suzuki RGV500 and the Yamaha YZR500. This was also the first motorcycle-themed racing game to sense players' positions on their cycles, and calculate their wind resistance. This page was last edited on 29 March 2016, at 09:00.